Create A new Topic about an event that is not included here by clicking "Post Reply" and name that topic the title of the event. Or use a quick reply to add any comments to existing posts/events such as strategy or final rank/rewards. The Second Battle of New York is a Faction Event beginning 12:00 PM (EDT) September 1, 2016 and ending 12:00 PM (EDT) September 6, 2016. Players can complete shuttle missions for the Federation, the Hirogen, or Section 31. These missions will drop Victory Points, which unlock Threshold Rewards. This event offers a Special Pack that has a guaranteed drop of RAF Julian Bashir, RAF Miles O'Brien, Aviator Yar, or Tuskegee Mayweatherif you spend 650 on the 10-pack pull. For the first time, choose which faction to support in this event! Unique Federation, Hirogen, and Section 31 missions are available during the event. Get Transmissions from Faction Centers to start them. Using any version of O'Brien, Bashir, Yar, or Mayweather will provide a bonus to Event Faction Missions. Every Event Faction Mission you succeed at earns you Event Victory Points. Collect Victory Points to unlock Event Threshold Rewards. After the Event ends, Players who are high in the rankings will have a special opportunity to decide where the story goes next! Victory Points will be earned in each event by doing shuttle missions. The more points you collect, the higher the Threshold Rewards you can receive. Using any variation of the BONUS Characters in a shuttle mission does not increase points. Additionally, the top 5 ranks (from both solo and squadron leaderboards) will help decide where the story goes next. The temporal powers that once fought a war to change history are at it again—this time trying (in vain) to prevent the current temporal anomaly crisis from ever occurring. Several of these powers blame the Federation for the crisis, and are thus engaged with ensuring Captain Jonathan Archer and the NX-01 do not survive the First Battle of New York. If Captain Archer never founds the Coalition of Planets, the United Federation of Planets will never exist! Adding to the confusion are the Hirogen—who promise to ensure Captain Archer’s survival as long as they get to hunt as many Axis powers as they wish—and Section 31, suspected of having taken over the Department of Temporal Investigations. You must assist whomever they believe will ensure an Allied victory and Captain Archer’s survival, while getting the opportunity to make decisions about who will escape this timeline and who must remain behind. Victory Points earned for each faction will determine which faction "wins." After the event ends, members of the top five squadrons will be given a chance to vote on which of two characters gets to advance the storyline. After that, the top five individually ranked players will get to decide how the story ends. Congratulations to all that participated in the event " The Second Battle of New York ". This was one of the better shuttle mission events that they had and the first to feature the new "Squad" feature and thus, finally giving some purpose in being IN a fleet. 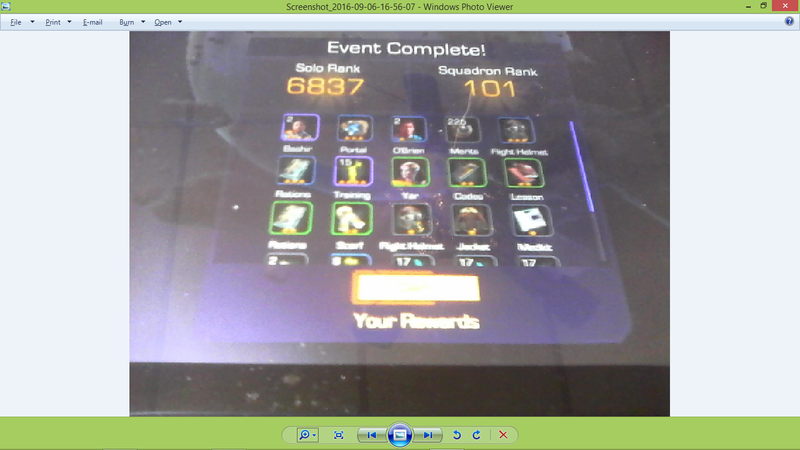 The top placing squad formed in the first squad style event in UFP Starfleet is the " [UFP-SF] Squadron "
The [UFP-SF] Squadron included the following players. Honers to Ma and SonicJ for clutching the top two spots with both sporting scores above 100,000 while I did not pass the 50k point threashold. Our [UFP-SF] Squadron finished with the rank of #101 with " Gays In Space " squadron securing the top 100th spot. So congratulations to them too as well as the other top 99 squadrons that participated in the " The Second Battle of New York " event.